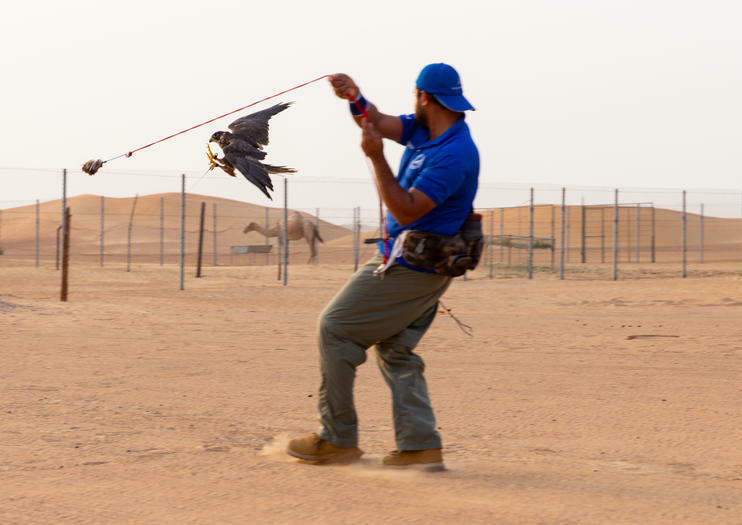 The sport of falconry, where graceful birds of prey swoop through the sky to catch small game, is woven into the cultural heritage of the United Arab Emirates—it's been a part of desert life in the region for hundreds of years. While you might not expect such a sport in ultramodern Dubai, the city is, in fact, an epicenter of falconry and a wonderful place to witness the skill of falconers and their trained birds. Here are a few ways to do so. Viewing falconry in action is an impressive and thrilling experience, one that's often included in day tours into the Arabian desert outside of Dubai. These tours are great for those pressed on time, as they typically include a camel ride and dinner in a Bedouin-style camp, allowing travelers to fit many of Dubai's iconic desert experiences, including falconry, into a single day. The only thing better than watching a falconer in action is becoming a falconer yourself. Pull on a glove for a hands-on lesson in both modern and ancient techniques of falconry from a top-notch falcon trainer. You'll quickly have birds launching from your fist to collect food and return to your waiting hand. These experiences often take place at the Dubai Desert Conversation Reserve, where travelers can begin or end a visit with some wildlife-spotting for gazelle, Arabian oryx or hares. Tour the Abu Dhabi Falcon Hospital, the region's first and only facility dedicated to falcons, to gain a deeper understanding of the close relationship between the Bedouin culture and the desert's birds of prey. The onsite treatment center rehabilitates injured birds and caregivers are happy to provide insight into common ailments and treatments, while a small museum showcases traditional falconry equipment and information on the various falcon species. Experience the majesty of the UAE’s falcons and desert on this 5-hour tour from Dubai. Visit a desert retreat for a spectacular falconry display and try flying a falcon yourself as you learn about this ancient Bedouin practice. Afterward, take a wildlife drive through the Dubai Desert Conservation Reserve in a vintage Land Rover, or upgrade to a plush Range Rover. Look for rare Arabian oryx, gazelle and other species on route, and finish with snacks and a camel ride. Numbers are limited to 16 for a more personalized experience. Fly a falcon and enjoy a desert wildlife drive on this 5-hour experience from Dubai. Board a 4x4 and roam the Dubai Desert Conservation Reserve to watch for animals such as the rare Arabian oryx, hares and more. Then, enjoy a thrilling, interactive group falconry experience. Learn to fly a falcon from your glove, and see some prized birds and training techniques in action. Upgrade to include breakfast at the stylish Al Maha Desert Resort to make the morning extra special. Numbers are limited to 12 for a personalized atmosphere. Discover Dubai’s ancient hunting traditions on this private 5-hour falconry experience and wildlife tour. Visit a beautiful retreat nestled among the desert dunes with your private guide. Enjoy the chance to interact with elegant falcons, and learn of their life-cycles, diet and natural habitat. Then, watch a traditional falconry display and admire the birds’ power and prowess in the air. Afterward, visit the Dubai Desert Conservation Reserve and search the sands for sightings of native oryx and gazelles. Visit three of Abu Dhabi’s top drawcards — Sheikh Zayed Mosque, the Falcon Hospital and Ferrari World — on a full-day trip from Dubai. Travel south to the UAE’S futuristic capital, and take a guided tour of the Sheikh Zayed Mosque, one of the world’s largest. Behold the lavish interiors, take a panoramic city tour, and then visit the Falcon Hospital to see how its treats these birds of prey and watch a stunning falconry display. Lastly, enjoy time at Ferrari World, the thrilling Ferrari-brand indoor theme park, before returning to Dubai.